Moisturizing is an essential part of any skin care routine. It helps us to make our skin look good and feel its best. No matter what is your skin type, but it is important to moisturize. There are many options for specific skin types. So choose the right one. From last three month, I am using lotus herbals alphamoist oil free moisturizer. This is for all type of skin. Today I am going for a review on it. Alpha Hydroxy Skin Renewal Oil-Free Moisturiser Details Plant-derived hydroxy extracts present in this light oil-free moisturizer replenish moisture, provide a glowing, smooth complexion and reveal fresh skin. The complexion is rejuvenated, looking and feeling younger. Clean your face thoroughly. Apply lavishly all over face and neck. Use regularly in morning and evening. I love their Moisture Packaging which comes in a very light yellow bottle with pump top cap. The pump cap is very hygienic and easy for using. This kind of Packaging makes the product very travel-friendly. The oil-free moisture has creamy and soft texture and not so thick. This Moisture feels very light on the skin. The moisturizer has a mild and pleasant fragrance ( a slightly medicated smell which I feel). The fragrance is not overpowering and is a bit of artificial while using it. Also, the fragrance doesn't linger around after application. It is very important to pick the right moisturizers for your skin. When you know that your skin changes in the different season then you have to choose the right one at the right time. I have started using this product from the first week of February and the weather was a bit cold. Since my skin is dry so at that time this oil free moisturizer does not work as expected on my skin. After applying, my skin felts dry and stretchy. So I stop using this. In the spring I again started to use this moisturizer. Now I felt better than in compared to the winter season. Pune’s weather is very dry in summer (as well as winter) but this time my skin seems like combination skin (sometimes feel dry). Alphamoist Oil-free Moisturizer works little bit well during this summer compared to other season. I normally use it twice a day, once in morning and once in the evening. I do one pump initially and that is enough for my face and neck completely. If you need more, then you can do pumps accordingly. The moisturizing effect stays about 5 -6 hours. It spreads easily on the skin. It gets absorbed fast without leaving any oily feeling on the skin during the application. This water based Moisturizer feels very lightweight on the skin. I use this Moisturizer as a makeup base and it works well. After application, my skin feels soft and smooth. The pump dispenser is convenient to use and it gives you good control over the amount of product you need. Affordable price and easily available. It does not cause any skin problem. This one does not provide enough hydration for dry skin. Skin feels bit stretchy after application. Lotus Herbals Alphamoist Alpha Hydroxy Skin Renewal Oil Free Moisturizer will work for those who have oily, normal, combination skin. So I will recommend this product for such skinned beauties. Overall I felt, this lightweight, oil-free moisturizer gets absorbed into the skin quickly. It provides a vibrant smooth and a rejuvenated complexion and reveals fresh newer skin. It makes the skin soft, supple and keeps oil at stay for 5-6 hours. It is a good oil free moisturizer for oily to combination skin. All dry skin ladies keep yourself away from this product. My suggestion to Lotus Herbals, they should change the tagline (all skin types) from their bottles. 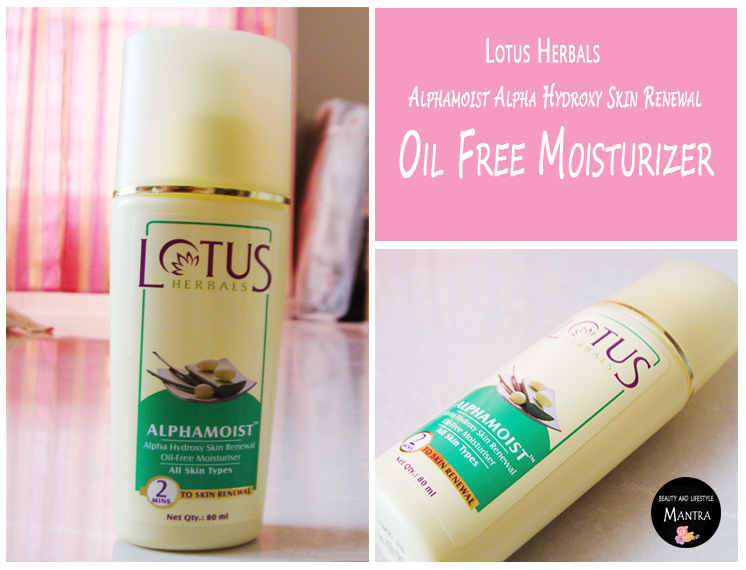 Lotus Herbals Alphamoist Alpha Hydroxy Skin Renewal Oil Free Moisturizer is not for all. Otherwise, this Skin Renewal Oil Free Moisturizer is a very good product. ** This post is not sponsored. All products are bought with my own money, and reviewed at my own discretion. Great article. Having a flawless skin is every girl's dream. I always struggle in finding a good oil free moisturizer for my skin type. There are several good options available in the market in variable prices but after reading your post I am confident enough to go for a product suitable to my skin type.